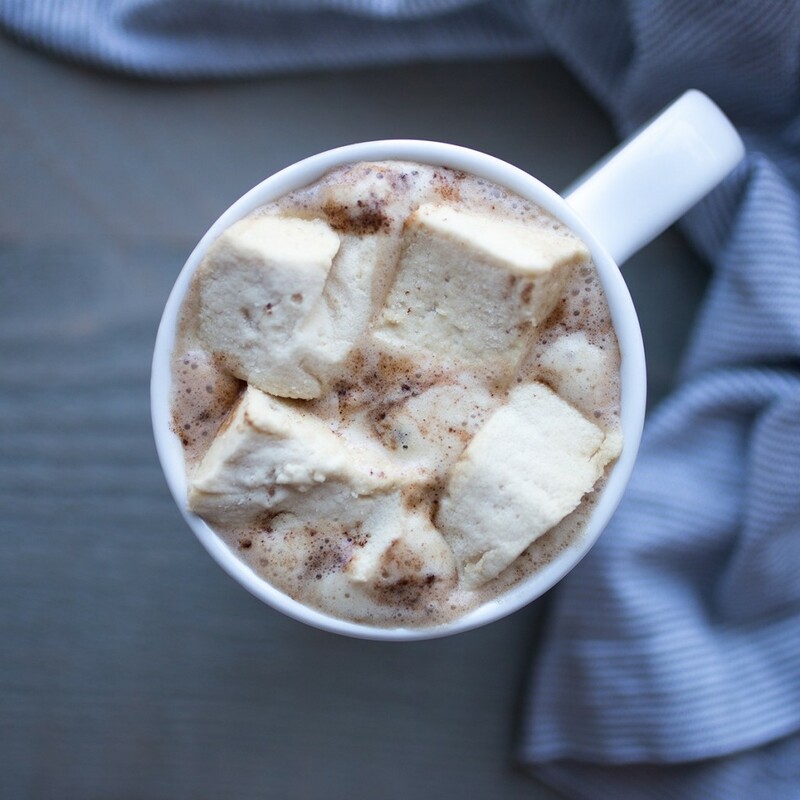 With all of the cold weather and snow happening across the country, it seemed fitting to post a marshmallow recipe! Because let’s be honest, what is hot chocolate without marshmallows?? You might be asking yourself, why would I make marshmallows when they’re so easy to find pre-made at the store? Well, I have several answers to that question. 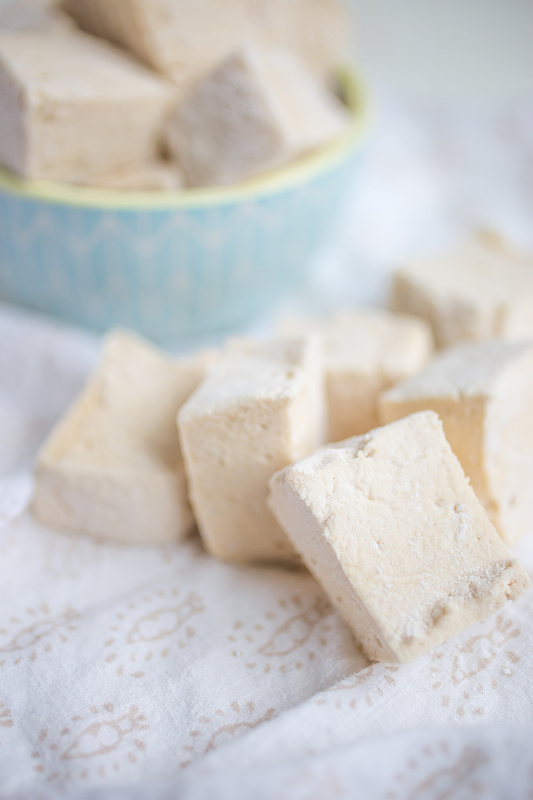 First off, homemade marshmallows are SO different than their store bought counterparts. They have an almost fluffier texture and taste a lot more flavorful. They also melt so much better than any store-bought marshmallow I’ve tried. Plop a few on top of your next cup of hot chocolate and you will be amazed at how much delicious, marshmallow-y foam appears on the top of your mug. 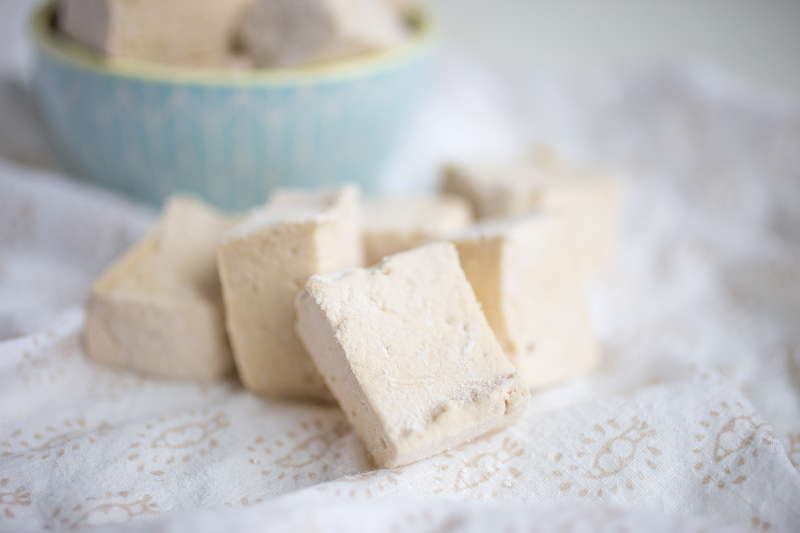 Not only will these marshmallows wow you in terms of flavor and texture, but they’re also a whole lot easier to make than you might think. AND, in case you needed even one more reason to try these out… best of all, you can prepare them with high-quality gelatin from pasture-raised beef, which you’d be hard pressed to find in any store-bought brand. 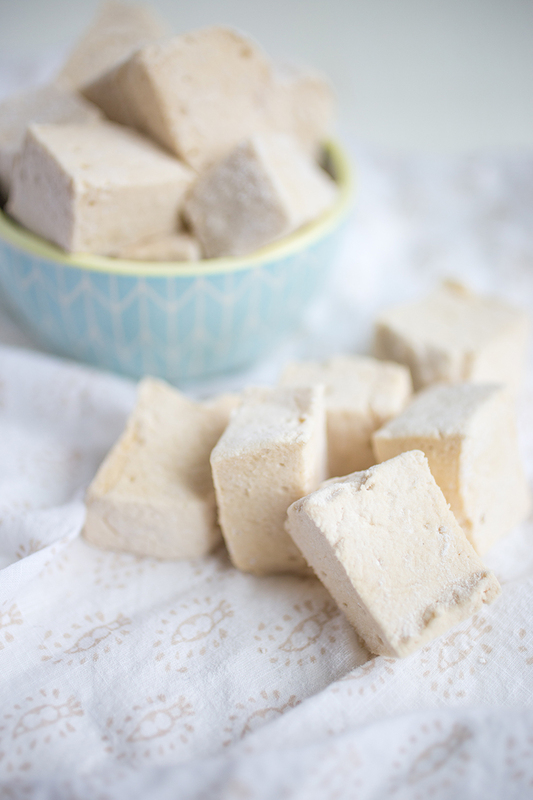 Not only are these marshmallows delicious, they are also super beneficial for gut health because of the gelatin. Sure, I consider these “treats” but I also pop one or two of these in my mouth guilt-free knowing I am treating my gut well! For someone that has a long history of digestive issues, I am a big fan of anything to support gut health, especially when it tastes so good! I absolutely love maple syrup so I decided to sweeten these with only maple syrup. However, if you’re not a huge maple syrup fan or if you want these to taste a bit more mild, feel free to sub the maple syrup for any other sweetener or do half and half. Honey or coconut nectar would also be great options. Grease a parchment-lined 9x9 pan or similar with ghee or coconut oil. Dust the bottom of the pan with half of the arrowroot or tapioca. In a large bowl or stand mixer, combine gelatin and ½ cup water. Allow to sit. In the meantime, combine all remaining ingredients, other than arrowroot powder (and the fat you used to grease the pan) in a medium sauce pan. Bring to a boil and using a thermometer, cook until the temperature of the mixture reaches 240°. This should take about 12-15 minutes. Once desired temperature is reached, slowly and carefully pour heated mixture into the gelatin and water while slowly increasing the speed of the stand mixer or, while using a hand mixer. After about 6 minutes in a stand mixer or 10 or so minutes using a hand mixer, your marshmallow mixture should start to resemble marshmallow fluff. Once this happens, turn off your mixer. Quickly pour marshmallow mixture into your previously parchment-lined pan and spread evenly. Dust remaining arrowroot or tapioca onto the top of the marshmallow mixture and allow to sit for 3-4 hours. After a few hours have past, use the parchment paper to pull and remove the mixture from the pan. Carefully slice marshmallows into 1-inch square pieces. Place marshmallows into a bowl and add just a pinch or two more of your tapioca or arrowroot to fully coat the marshmallows and prevent them from sticking. Wipe off any excess flour and store in the refrigerator or freezer. So cool! I’ve been wanting to try homemade marshmallows for a while. The fact that these are healthy + that last photo with the cocoa have totally sold me–can’t wait to try this! Yay! So glad I could convince at least one person. 😉 LMK what you think!! Those look amazing — I already have the VP gelatin — can you recommend a good source of tapioca starch? My Whole Foods only carries small boxes (a little more than a cup per box.) Thanks! Do you put the tablespoon of ghee or coconut oil in the mixture you are heating on the stove or is it used to grease the pan? Want to be sure I don’t mess this up ’cause they sound amazing! Hi Kathy, sorry if that was unclear. You use the ghee or coconut oil to grease the parchment lined pan! Hey! I want to make these and add them to some homemade paleo icecream. Do you think they will work if added to the icecream? Or will freezing them have an unusual affect on them? I’m excited to try your recipe! Hi Amber, this is actually a good question. I’m not sure! I have never tried to freeze these, but my instinct tells me it would be okay. I would definitely cut them in much smaller pieces before freezing them, but you should be okay. Let me know how it goes, you made me really want ice cream with marshmallows! Hi Anya. I’ve used marshmallow root as a remedy for health issues for many years. Then, I was hit by a car and paralyzed more recently (2 1/2 years ago). Many paralyzed people get edema (swollen feet). Most won’t believe my herbal suggestions. I looked up how to make marshmallows with real marshmallow root in hopes that I can win some converts over to natural healing. I’m getting ready to order some stevia powder, hoping to use it as part of the sweetener. If you have ever used stevia in/on marshmallows, please “do tell”. Thanks for your beautiful presentation. Thanks for that link. It looks lovely. I’ve ordered the stevia powder, but haven’t been able to find my electric mixer since my “escape” from the nursing home, back to my own house. I’ll be buying another mixer soon. By the way, I am adamantly against consuming artificial sweeteners, so that was just one more reason that I wanted out of the nursing home. I am making these right now! Thanks. 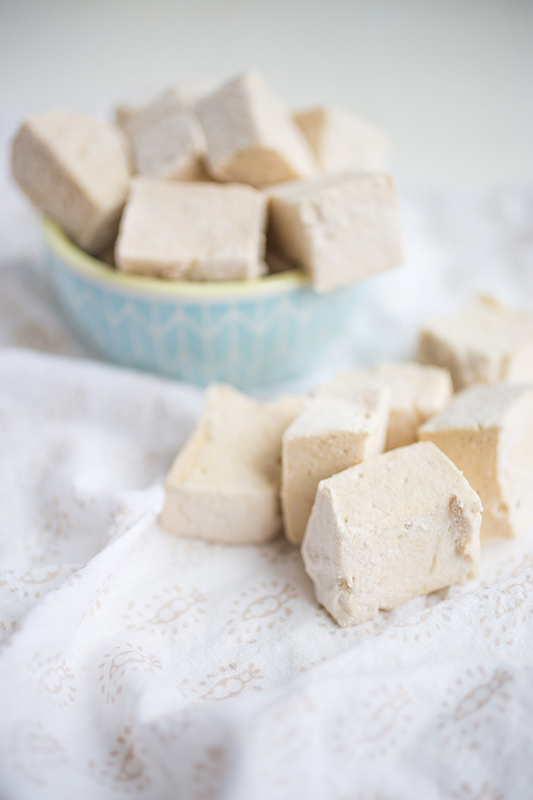 I have made the honey gelatin marshmallows before, but then found out that I can’t tolerate the high FODMAPS, of which honey is high on that list of avoids. So, my daughter needs marshmallows for camp each summer for smores (I also make a coconut flour graham cracker for her). But of course, I wind up eating some of the marshmallows too. So thought I would try maple syrup so that I can eat them without having digestive problems (I already know that I tolerate maple syrup). I had just swapped out maple syrup for the honey in the recipe I have used for years, which doesn’t even require the thermometer (heat honey on medium and bring to a rolling boil, carefully watch over pot and let boil for 3 minutes), but after I got everything in the mixer, I got nervous about maple syrup not working. Thankfully, I came across your recipe. The blender has 4 minutes to go and is looking like fluff, so it’s on the way to turning into marshmallows. Thanks! So glad you enjoyed it, Nancy!